I am the granddaughter of the “great Marlo”. I have been reading tarot for over 30 years and working with the Law of attraction for over 20 years. 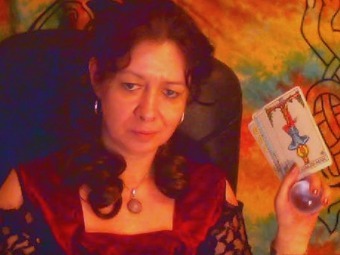 I collect oracle cards and other tools and enjoy working with my crystals and pendulums. I enjoy guiding customers and giving insight into many situations such as career & work, compatibility between 2 parties using astrology or other tools, remote viewing, removing emotional blockages and psychic development. I can work with any of my tools, cards, crystal ball or pendulum for example or I can work no tools/freehand, with my natural senses and guides. I do however love my Rider Waite Tarot Cards. I have been reading them so long they have become an extension of myself. Had a reading with Shelleigh last night. Didn't really connect with her or get much out of the reading. That said she was a lovely, friendly lady and I can see why others would enjoy her readings. She just wasn't the right psychic for me. l do not Know where l would be without the truly protective, brilliant and extremely inspirational readings that l have had over the years with Shelleigh: she is so special and is wonderful at really helping people with her incredible gift. Thank you dear Shelleigh. The help,guidance and protection that Shelleigh has given to me over the past seven months has been immeasurable.She came in with her readings like the cavalry and set my path for peace of mind.She is wonderful and brilliant,which obviously runs in her family.I thank you Shelleigh with true sincerity. Thank you dear Shelleigh for your brilliant mind expanding reading a few weeks ago;l am so glad that l took your brilliant advice,which is giving me such great support and peace of mind now.I think you are great and very gifted. Shelleigh's reading was one of the best experiences I've had and the 1st time I've for me. Most of what was said was relative to my life on many levels. If anyone wishes to have a tarot reading, my advice is to try Shelliegh Marlo! Shelleigh's reading was one of the best experiences I've had and the 1st time I've for me. If anyone wishes to have a tarot reading, my advice is to try Shelliegh Marlo! Get 15 minutes to speak to Shelleigh Marlo for just £4.99 (that’s a value of £22.50! )..